For some athletes and for many people who run, jog, cycle, lift weights and otherwise exercise, music is not superfluous—it is essential to peak performance and a satisfying workout. Although some people prefer audio books, podcasts or ambient sounds, many others depend on bumpin’ beats and stirring lyrics to keep themselves motivated when exercising. A quick Twitter search uncovers plenty of evidence: “Trying to let my phone charge a little more before I go, because lord knows I can’t even try and workout without music,” tweeted @Gianna_H21. “I just made my mom turn around to get my headphones. I can’t possibly work out without music,” @Codavoci_Kyle admitted. Selecting the most effective workout music is not as simple as queuing up a series of fast, high-energy songs. One should also consider the memories, emotions and associations that different songs evoke. For some people, the extent to which they identify with the singer’s emotional state and viewpoint determines how motivated they feel. And, in some cases, the rhythms of the underlying melody may not be as important as the cadence of the lyrics. In recent years some researchers and companies have experimented with new ways to motivate exercisers through their ears, such as a smartphone app that guides the listener’s escape from zombies in a postapocalyptic world and a device that selects songs based on a runner’s heart rate. Research on the interplay of music and exercise dates to at least 1911, when American investigator Leonard Ayres found that cyclists pedaled faster while a band was playing than when it was silent. Since then psychologists have conducted around a hundred studies on the way music changes people’s performance in a variety of physical activities, ranging in intensity from strolling to sprinting. Looking at the research as a whole, a few clear conclusions emerge. Two of the most important qualities of workout music are tempo—or speed—and what psychologists call rhythm response, which is more or less how much a song makes you want to boogie. Most people have an instinct to synchronize their movements and expressions with music—to nod their heads, tap their toes or break out in dance—even if they repress that instinct in many situations. What type of music excites this instinct varies from culture to culture and from person to person. To make some broad generalizations, fast songs with strong beats are particularly stimulating, so they fill most people’s workout playlists. In a recent surveyof 184 college students, for example, the most popular types of exercise music were hip-hop (27.7 percent), rock (24 percent) and pop (20.3 percent). Some psychologists have suggested that people have an innate preference for rhythms at a frequency of two hertz, which is equivalent to 120 beats per minute (bpm), or two beats per second. When asked to tap their fingers or walk, many people unconsciously settle into a rhythm of 120 bpm. And an analysis of more than 74,000 popular songs produced between 1960 and 1990 found that 120 bpm was the most prevalent pulse. When running on a treadmill, however, most people seem to favor music around 160 bpm. Web sites and smartphone apps such as Songza and jog.fm help people match the tempo of their workout music to their running pace, recommending songs as fast as 180 bpm for a seven-minute mile, for example. But the most recent research suggests that a ceiling effect occurs around 145 bpm: anything higher does not seem to contribute much additional motivation. On occasion, the speed and flow of the lyrics supersede the underlying beat: some people work out to rap songs, for example, with dense, swiftly spoken lyrics overlaid on a relatively mellow melody. Although many people do not feel the need to run or move in exact time with their workout music, synchrony may help the body use energy more efficiently. When moving rhythmically to a beat, the body may not have to make as many adjustments to coordinated movements as it would without regular external cues. In a 2012 study by C. J. Bacon of Sheffield Hallam University, Karageorghis and their colleagues, participants who cycled in time to music required 7 percent less oxygen to do the same work as cyclists who did not synchronize their movements with background music. Music, it seems, can function as a metronome, helping someone maintain a steady pace, reducing false steps and decreasing energy expenditure. Extending this logic, Shahriar Nirjon of the University of Virginia and his colleagues devised a personal music player that attempts to sync music with a runner’s pace and heart rate. Accelerometers and a tiny microphone embedded in a pair of earbuds gauge the runner’s pace and record the pulsing of blood vessels. The device wirelessly transmits the data it collects via a smartphone to a remote computer that chooses the next song. 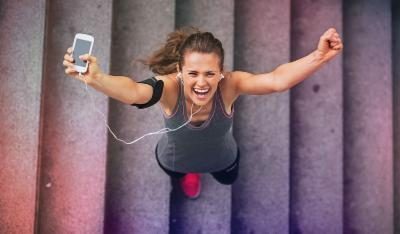 Recent research clarifies not only what type of music is best suited to a workout, but also how music encourages people to keep exercising. Distraction is one explanation. The human body is constantly monitoring itself. After a certain period of exercise—the exact duration varies from person to person—physical fatigue begins to set in. The body recognizes signs of extreme exertion—rising levels of lactate in the muscles, a thrumming heart, increased sweat production—and decides it needs a break. Music competes with this physiological feedback for the brain’s conscious attention. Similarly, music often changes people’s perception of their own effort throughout a workout: it seems easier to run those 10 miles or complete a few extra biceps curls when Beyoncé or Eminem is right there with you. “Given that exercise is often tiresome, boring and arduous, anything that relieves those negative feelings would be welcome,” Karageorghis explains. The benefits of distraction are most pronounced during low- to moderate-intensity exercise. When up against high-intensity exercise, music loses its power to override the physical feelings of tiredness, but it can still change the way people respond to that fatigue. The right music elevates mood and persuades people to ride out waves of exhaustion, rather than giving up. Karageorghis cautions, though, against listening to music while running in heavily trafficked areas—distraction from fatigue is great, as long as it does not put you in danger. Music also increases endurance by keeping people awash in strong emotions. Listening to music is often an incredibly pleasurable experience and certain songs open the mental floodgates with which people control their emotions in everyday situations. If one strongly identifies with the singer’s emotions or perspective, the song becomes all the more motivational. Consider a song from someone’s favorite musical film or Broadway show, such as “One Day More” from Les Misérables—an ensemble song with a complex melody and building energy—or “Defying Gravity” from Wicked, in which Elphaba, a central character, vows to overcome all limits others have imposed on her. In addition to exhilarating melodies and vocals, such songs immediately recall the entire milieu of the performance and awaken memories of particular characters who are part of a complex narrative. This mesh of associations and connotations woven into the music provides not just an inspiring perspective to adopt, but also an entire alternate reality to enter while running in place on a treadmill at the gym. Some game designers have experimented with new ways for people to escape into fictional worlds while running. In 2012 the online game company Six to Start released the immersive running game, Zombies, Run!, in the form of a smartphone app that narrates the listener’s quest to survive the zombie apocalypse. Following spoken prompts, the listener imagines him or herself running around to collect ammunition and medicine to complete various missions. Whether music or zombie sound effects, what people listen to for motivation when they exercise acts on the same neural circuitry. “We are almost hardwired to appreciate music aesthetically,” Karageorghis says. People’s emotional response to music is visceral: It is, in part, ingrained in some of the oldest regions of the brain in terms of evolutionary history, rather than in the large wrinkly human cortex that evolved more recently. One patient—a woman known in the research literature as I. R.—exemplifies this primal response. I. R. has lesions to her auditory cortices, the regions of the cortex that process sound. When I. R. hears the normal version of a song and a horribly detuned version, she cannot tell the difference, explains Jessica Grahn, a cognitive neuroscientist who studies music at Western University’s Brain and Mind Institute in Ontario. But when I. R. hears a happy song and a sad song, she immediately distinguishes them from one another. In fact, the human brain may have evolved with the expectation that, wherever there is music, there is movement—although this idea emerges more from the imaginative minds of speculating evolutionary psychologists than from experimental evidence. Before the invention of reed flutes and other musical instruments, our ancestors likely produced the earliest forms of music by singing, screaming, chanting or otherwise using their vocal cords, as well as by physically interacting with their own bodies, other people and the environment. A fast tempo would have likely required fast movements: quick clapping or foot stamping, perhaps. Deep, loud sounds would have demanded great energy and force—belting a note or beating the ground or a rock. In its conception, music was likely an extension of the human body. Maybe the brain remembers it that way. Listen to Fit Radio for the best workout music for any workout at fitradio.com.